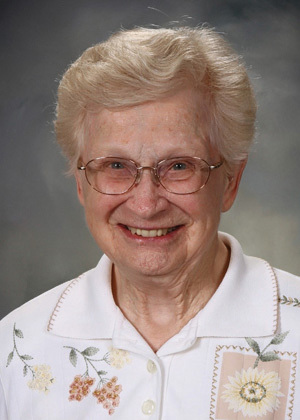 Sister Anita Therese Hayes, BVM died Sunday, April 14, 2019, at Marian Hall, Dubuque, Iowa. Visitation, the Sharing of Memories and Mass of Christian Burial were on Wednesday, April 17, 2019. Burial was in the Mount Carmel cemetery. Sister Anita Therese was born on Nov. 12, 1922, in Cascade, Iowa, to Cyril & Viola Stanton Hayes. She entered the BVM congregation Sept. 8, 1941, from St. Martin Parish, Cascade. She professed first vows on March 19, 1944, and final vows on Aug. 15, 1949. Sister Anita Therese was an elementary principal and teacher at St. Paul in Burlington, Iowa, and St. Patrick in Lead, S.D. She also taught in Iowa at St. Patrick in Tama, St. Anthony in Davenport, and St. Anthony Dubuque, and at Blessed Sacrament in Chicago. She served the congregation as Motherhouse administrator, regional representative, archivist, and archives researcher. “Anita enjoyed life, every drop of it. Whether tapping her toes while watching Irish dancers, singing in the schola, talking with donors as part of the Sisters Development Network, or offering greetings as she walked down the hall, Anita left sunshine and happiness in her wake. . . There is probably no more fitting way to sum up Anita Therese than the way she described every sister she spoke about: ‘She was a darling.’” (Eulogy). She was preceded in death by her parents; brothers Joseph and James; and sisters Rita Rhoads, Kathleen Myrick, Therese Streeper, and Mary Monica Hayes. She is survived by a brother-in-law Russel Streeper, Onslow, Iowa; nieces; nephews; grandnieces; grandnephews; and the Sisters of Charity, BVM, with whom she shared life for 77 years. I met Sr. Anita through Sr. Gabrielle Hagerty, what a treasure. She was always so friendly and always had a twinkle in her eyes! I am sure they are now enjoying an Irish Coffee together again. Sister Anita Therese Hayes was active with Dubuque CROP Walk for at east 20 years, as I first met her with my involvement in 1997. CROP Walk is an ecumenical project which helps the poor, and Sister Anita Therese helped organize this with letters to parish organizers in the spring, and with the organizers meeting in August, and with the Walk on the first Sunday in October. Sister Anita Therese was always a welcoming person, with a smile and greeting and interest in others. It was always a pleasure seeing her and visiting with her over the years. May she rest in peace and joy.